At one point in my high school career I was actually attending three different churches weekly. On Sunday morning I went to our Baptist church with my mom. On Sunday evening I went to youth group at a Presbyterian church I had started attending with a friend in middle school. On Wednesday evenings (or Tuesdays or Thursdays or whatever it was) I went to bible study with the Presbyterian gals. On Thursdays I went to youth group at a Methodist church where a lot of my friends from school went. My mom called me a Baptisbyterian (which doesn’t include the word “Methodist” but I didn’t go there for very long). It was a lot of church and it was super fun. I wasn’t stoked about what the Methodist youth pastor had to say most of the time, but like I said, a lot of my friends from school went to that church and a lot of those friends happened to be guitar-wielding fellas so I probably would’ve sat through quite a lot of heretical preaching if it meant sitting next to the hot Christian drummer with the plugs. 1. The girl in charge was super mean and bossy and intimidating. 2. When we did the SNL Van Down by the River skit the guy playing Chris Farley jumped on the coffee table and really broke it and really was bleeding all over the place and nobody knew what to do. 3. My friend David and I ended up quitting because the mean, bossy girl was trying to force us to do something awful. I have no recollection of what she wanted us to do but I remember feeling very strongly about not doing it. We ended up quitting before getting the chance to perform our lip sync to Moulin Rouge’s Elephant Love Medley. On one of our many mission trips. 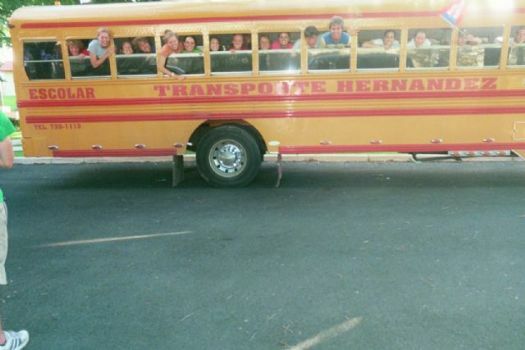 This particular bus took us around Puerto Rico for 10 days. David and I sang the Elephant Love Medley to each other on a Youth Group trip (I don’t recall where to). You missed out. darnit! oh well, at least the song was sung. I remember having to cut you out of the van!!! I felt so bad because the more I tried to get you out the tighter the belt became!!! I also just looked at BruHaHa pictures where you wrestled in jello!!! Great memories!! What I love most is to see you now serving God in such an amazing way. Those crazy trips and games are fun but what is most important is that god used us to help you build this life long relationship. Love you!! tracy, thank you so much for the huge role you played in my relationship with Jesus and for getting me out of that van!! i’m sure you have TONS of crazy youth group stories! love you so much!